The bare bones of the match are that Burnley won with a single goal from Ashley Barnes on the 73rd minute, after Tadić had missed a penalty awarded when George Boyd had been daft enough to foul inside the penalty area, right in front of the referee, Mark Clattenburg. Well, here we are again. Look at the statistics on the right and you see that Saints dominated, yet failed to turn the chances into goals. Yet to listen to a lot of Saints fans, this was a very poor performance. Maybe we are on a losing streak, yet in spite of the injuries, the only one of the four games in that losing run we truly deserved to lose was the Manchester City game (and who knows what might have happened there, if Schneiderlin had not had to go off injured). Talking of injuries, Morgan Schneiderlin was not quite ready to return for this match, but should definitely be back for the next home game against Everton and might even make the League Cup game agains Sheffield United in the week. However, there was the very welcome sight of James Ward-Prowse on the bench, making his return from a long lay-off. Also returning, from what had been feared to be several unwanted weeks off, but turning out to be just the one game away, was Toby Alderweireld. The surprise inclusion was Jake Hesketh, making his first start at senior level, after his impressive cameo role last week. The first half was unremarkable for anything, other than Hesketh doing a good impression of a terrier. In half an hour he managed to get himself booked and then was injured, through no fault of his own, having to be replaced by Ward-Prowse. He then sat on the Saints benches in tears of frustration. I have no doubt that we will be seeing a lot more of this impressive youngster. Burnley had the better of the early exchanges, but gradually Saints began to get the upper hand, creating more chances from more possession. 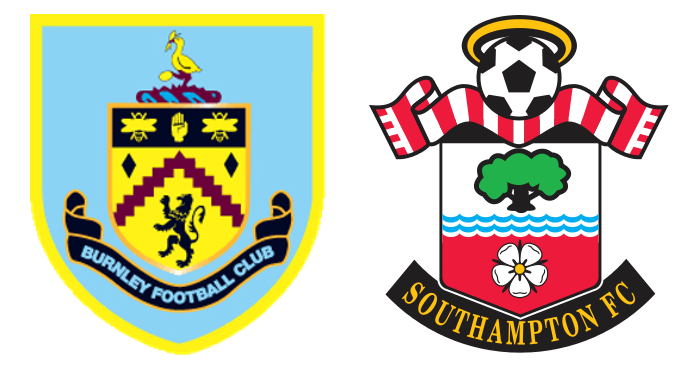 The second half saw Saints continuing to exert their grip on the game, without really troubling Heaton in the Burnley goal. Then came arguably the key moment in the game, when George Boyd upended Bertrand inside the box, right in front of Mr Clattenburg, who pointed straight to the spot. Dušan Tadić took Saints first penalty of the season and aimed for the lower right of the goal. Unfortunately that was exactly where Heaton had guessed the ball was going and he pushed it around the post for a corner, which came to nothing. Up until this point Saints were on top and the miss was a big psychological blow. Worse was to follow, as just over ten minutes later came a strange sequence of events. Clyne was attempting to clear the ball, but just in front of him was Ings, who managed to block the shot and the ball fell for Barnes to pick up and shoot at goal. Alderweireld managed to get the slightest of touches on the ball, but only succeeded in pushing it just beyond Forster and into the net. 1-0. From then on Saints managed to create several good chances to score, with Ward-Prowse's set pieces looking especially dangerous. Clyne managed to clip a post with one of his trademark long range shots and Victor Wanyama missed probably Saints best chance of the game, deep into injury time, when he headed over a Ward-Prowse free kick, from right in front of the goal. So, the fourth defeat in a row for Saints. In spite of my disappointment at losing another game, which could and should have been a win, there are plenty of things to take from the game. Jake Hesketh may have only been on the pitch for 30 minutes, but I have seen enough of him in the last two games to think that Saints could well have another potential star in the making. There were also good games from Ward-Prowse, Bertrand and Pellè, although the big Italian striker was booked, which could see him missing the Cup game this week. It seems to me that Saints really are playing no worse than in their winning streak, in spite of injuries, it's just that things do not seem to be falling for them in front of goal, while at the same time small errors in defence have been very costly. Onwards and upwards. Saints stay in the North, rather than travel home, as they are playing Sheffield United in the Capitol One Cup Quarter Final on Tuesday evening.